Miami has played six games on the road this season and its results are mercurial: Two wins, three losses, one tie against three opponents that have a combined one vote for the top 20. The RedHawks allowed three unanswered third-period goals in a 4-1 loss at New Hampshire to cap off an 0-1-1 weekend against a team that had one previous win this season. So Miami (9-6-1) will end the 2018 calendar year 2-3-1 with five road series remaining. Overall it’s been a productive first two months of 2018-19, but the RedHawks haven’t wowed on the road against opponents who are a combined 11-19-6, and things are about to get a lot tougher. THOUGHTS: Sorry we didn’t do a post from Saturday. That was partly because I was extremely busy and partly because the game feed keep cutting out. I lost a whole five minutes of game action at one point. Much of the other YouTube feed was choppy, unlike Friday. Some things still stood out. — Miami was outplayed on special teams, going 0-for-5 while UNH was 2 of 5. Both power play goals were scored when players were left wide-open in front of the net. — Backup Jordan Uhelski was in net but he was not the reason the RedHawks lost. He made two spectacular saves and was hung out to dry on two goals. It’s also hard to win when your support is one goal. — Jonathan Gruden was moved to the Josh Melnick-Gordie Green line, and the trio accounted for the lone Miami goal. Gruden had just five prior points this season and none in his previous five games. — New Hampshire (2-6-5) had not scored four goals in any game this season. It didn’t look like this was the RedHawks’ best effort defensively. 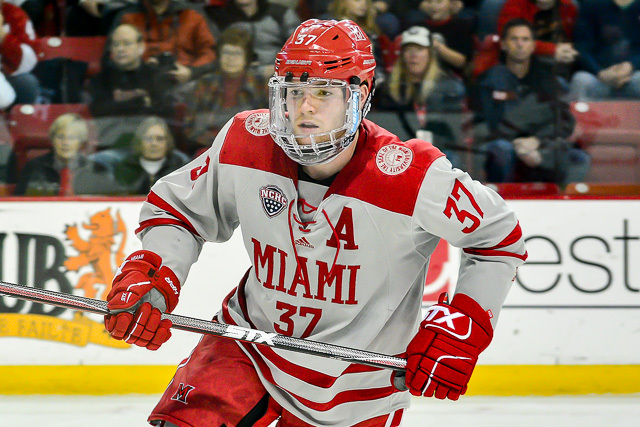 Posted on November 28, 2018, in 2018-19 and tagged 2018-19 miami redhawks, new hampshire wildcats. Bookmark the permalink. Leave a comment.